The family currently has 32,913 accepted species names, in 1,911 genera (list) and 13 subfamilies. In terms of numbers of species, the Asteraceae are rivaled only by the Orchidaceae. (Which of the two families is actually larger is unclear, owing to uncertainty about exactly how many species exist in each family.). Nearly all members bear their flowers in dense heads (capitula or pseudanthia) surrounded by involucral bracts. When viewed from a distance, each capitulum may have the appearance of being a single flower. Enlarged outer (peripheral) flowers in the capitula may resemble petals, and the involucral bracts may look like a calyx. The name Asteraceae comes from the type genus Aster, from the Ancient Greek ἀστήρ, meaning star, and refers to the star-like form of the inflorescence. Compositae is an older (but still valid) name that refers to the “composite” nature of the capitula, which consist of (few to) many individual flowers. The name Asteraceae (English: /ˌæstəˈreɪsi, –siˌaɪ, –siˌeɪ, –siˌiː/) comes to international scientific vocabulary from New Latin, from Aster, the type genus, + -aceae, a standardized suffix for plant family names in modern taxonomy. The genus name comes from the Classical Latin word aster, “star”, which came from Ancient Greek ἀστήρ (astḗr), “star”. Compositae (an alternative name) means “composite” and refers to the characteristic inflorescence, a special type of pseudanthium found in only a few other angiosperm families. The vernacular name daisy, widely applied to members of this family, is derived from the Old English name of the daisy (Bellis perennis): dæġes ēaġe, meaning “day’s eye”. This is because the petals open at dawn and close at dusk. Compositae, the original name for Asteraceae, were first described in 1792 by the German botanist Paul Dietrich Giseke. Traditionally, two subfamilies were recognised: Asteroideae (or Tubuliflorae) and Cichorioideae (or Liguliflorae). The latter has been shown to be extensively paraphyletic, and has now been divided into 12 subfamilies, but the former still stands. The phylogenetic tree presented below is based on Panero & Funk (2002) updated in 2014, and now also includes the monotypic Famatinanthoideae. The diamond denotes a very poorly supported node (<50% bootstrap support), the dot a poorly supported node (<80%). Members of the Asteraceae are mostly herbaceous plants, but some shrubs, climbers and trees (such as Lachanodes arborea) do exist. They are generally easy to distinguish from other plants, mainly because of their characteristic inflorescence and other shared characteristics. However, determining genera and species of some groups such as Hieracium is notoriously difficult (see “damned yellow composite” for example). In plants of the family Asteraceae, what appears to be a single flower is actually a cluster of much smaller flowers. The overall appearance of the cluster, as a single flower, functions in attracting pollinators in the same way as the structure of an individual flower in some other plant families. The older family name, Compositae, comes from the fact that what appears to be a single flower is actually a composite of smaller flowers. The “petals” or “sunrays” in a sunflower head are actually individual strap-shaped flowers called “ray flowers”, and the “sun disk” is made of smaller circular shaped individual flowers called “disc flowers”. The word “aster” means “star” in Greek, referring to the appearance of some family members, as a “star” surrounded by “rays”. The cluster of flowers that may appear to be a single flower, is called a head. The entire head may move tracking the sun, like a “smart” solar panel, which maximizes reflectivity of the whole unit and can thereby attract more pollinators. A set of bracts forms an involucre surrounding the base of the capitulum. These are called “phyllaries”, or “involucral bracts”. They may simulate the sepals of the pseudanthium. These are mostly herbaceous but can also be brightly coloured (e.g. Helichrysum) or have a scarious (dry and membranous) texture. The phyllaries can be free or fused, and arranged in one to many rows, overlapping like the tiles of a roof (imbricate) or not (this variation is important in identification of tribes and genera). Each floret may be subtended by a bract, called a “palea” or “receptacular bract”. 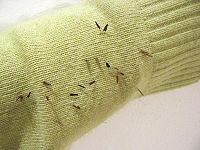 These bracts are often called “chaff“. The presence or absence of these bracts, their distribution on the receptacle, and their size and shape are all important diagnostic characteristics for genera and tribes. Several members of the family are copious nectar producers and are useful for evaluating pollinator populations during their bloom. Centaurea (knapweed), Helianthus annuus (domestic sunflower), and some species of Solidago (goldenrod) are major “honey plants” for beekeepers. Solidago produces relatively high protein pollen, which helps honey bees over winter. ^ a b c Viviana D. Barreda; Luis Palazzesi; Maria C. Tellería; Eduardo B. Olivero; J. Ian Raine; Félix Forest (2015). “Early evolution of the angiosperm clade Asteraceae in the Cretaceous of Antarctica”. Proceedings of the National Academy of Sciences of the United States of America. 112 (35): 10989–10994. doi:10.1073/pnas.1423653112. PMC 4568267. PMID 26261324. ^ “Asteraceae Bercht. & J. Presl”. Tropicos. Missouri Botanical Garden. Retrieved 14 July 2017. 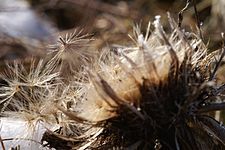 ^ “Family: Asteraceae Bercht. & J. Presl, nom. cons”. Germplasm Resources Information Network (GRIN). USDA, ARS, National Genetic Resources Program, National Germplasm Resources Laboratory, Beltsville, Maryland. Retrieved 12 June 2008. ^ a b c d e P.F. Stevens (2001). “Angiosperm Phylogeny Website”. Angiosperm Phylogeny Website. ^ “The Plant List: Compositae”. Royal Botanic Gardens Kew and Missouri Botanic Garden. Retrieved 18 November 2016. ^ a b “International Code of Nomenclature for algae, fungi, and plants – Article 18.5”. iapt-taxon.org. ^ a b Barkley, Theodore M.; Brouillet, Luc; Strother, John L. “Asteraceae”. In Flora of North America Editorial Committee. Flora of North America North of Mexico (FNA). 19, 20 and 21. New York and Oxford – via eFloras.org, Missouri Botanical Garden, St. Louis, MO & Harvard University Herbaria, Cambridge, MA. ^ “Phytochemical and Ethnobotanical Databases”. ars-grin.gov. ^ “dandelion Taraxacum officinale”. Invasive Plant Atlas of the United States. Retrieved 10 September 2012. ^ a b Merriam-Webster, Merriam-Webster’s Unabridged Dictionary, Merriam-Webster. ^ Panero, J.L. ; Funk, V.A. (2002). “Toward a phylogenetic subfamilial classification for the Compositae (Asteraceae)”. Proc. Biol. Soc. Wash. 115: 909–922. ^ a b Panéro, José J.; Freire, Susana E.; Ariza Espinar, Luis; Crozier, Bonnie S.; Barboza, Gloria E.; Cantero, Juan J. (2014). “Resolution of deep nodes yields an improved backbone phylogeny and a new basal lineage to study early evolution of Asteraceae”. Molecular Phylogenetics and Evolution. 80 (1): 43–53. doi:10.1016/j.ympev.2014.07.012. Retrieved 2017-01-03. ^ Zhi-Xi Fu; Bo-Han Jiao; Bao Nie; Tiangang Gao (2016). “A comprehensive generic‐level phylogeny of the sunflower family: Implications for the systematics of Chinese Asteraceae”. Journal of Systematics and Evolution. 54 (4): 416–437. doi:10.1111/jse.12216. Retrieved 2017-01-23. ^ Funk, Vicki A.; Fragman-Sapir, Ori (2009). “22. Gymnarrheneae (Gymnarrhenoideae)”. In V.A. Funk; A. Susanna; T. Stuessy; R. Bayer. Systematics, Evolution, and Biogeography of Compositae (PDF). Vienna: International Association for Plant Taxonomy. pp. 327–332. Retrieved 2016-12-27. ^ McKenzie, R.J.; Samuel, J.; Muller, E.M.; Skinner, A.K.W. ; Barker, N.P. (2005). “Morphology Of Cypselae In Subtribe Arctotidinae (Compositae–Arctotideae) And Its Taxonomic Implications”. Annals of the Missouri Botanical Garden. 92 (4): 569–594. JSTOR 40035740. ^ a b Panda, Sujogya Kumar; Luyten, Walter (2018). “Antiparasitic activity in Asteraceae with special attention to ethnobotanical use by the tribes of Odisha, India”. Parasite. 25: 10. doi:10.1051/parasite/2018008. ISSN 1776-1042. PMC 5847338. PMID 29528842. ^ Odom, R.B. ; James, W.D. ; Berger, T.G. (2000). Andrews’ Diseases of the Skin: Clinical Dermatology. W.B. Saunders Company. pp. 1135 pages. ISBN 0-7216-5832-6.